This, my fellow members of the Working Proletariat, is what the endless joy of Communism brings us. This beast of burden, this chromed harbinger of the downfall of the bourgeoisie, this generous mass that has been handed down to us by those who are more equal than others, is the true reward for harmoniously striving towards a common goal. Alright, so China isn't really communist anymore, even if they like to say they are. 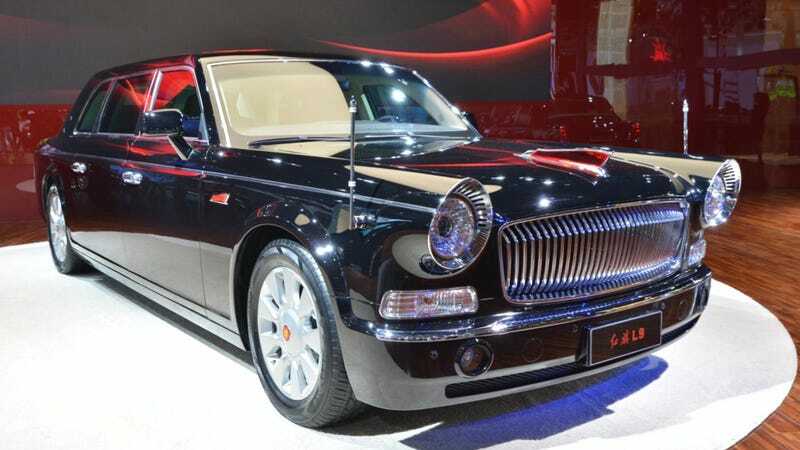 But this, the Hongqi L9, is what its Communist Party leaders can look forward to when they're being ferried about. In true communist tradition, it does look just like an updated version of a Chaika that Soviet leaders of old used to be driven around in as well. Hongqi (pronounced a bit like "Hong-chee," not "Honky") means "red flag" and is the traditional limousine maker for the Chinese leadership. The basic design of its L9 has been around for years, but this model is actually based on one that debuted for China's 60th anniversary celebrations, when it carried then-Chairman Hu Jintao for a review of the People's Liberation Army's best and bravest men and women. For the civvies the L9 is quite a bit lighter, thanks to all the armor and bulletproof glass removed, but somehow it still maintains its flag posts on the front fenders. I suppose that's so you can mount a Hoonigan shirt on one side and Blipshift shirt on the other, just so people know what you stand for. That's not to say it's small, however. The L9's little sibling, the L7 (pictured below) is still the length of a Phantom. The L9 is a bit longer than that, stretching to 6,395 mm, or more than 20 feet long, and it probably weighs somewhere between a billion and a trillion tons, though there is no official number as of writing. All of that heavy Chinese steel should be able to move with a bit of hustle, though, as under the hood lies an indigenously produced V12, sporting somewhere between 400 and 500 bhp. The best news here, however, is that this is the new "civilian" version being shown at the Shanghai Auto Show, for peasants like you and me, with a cost of only somewhere around $800,000, or two Rolls Royce Phantoms, depending on options. Unfortunately it's not even clear, however, if the L9 will be available to the regular public. Can we get this in America somehow? Please?